The naitional banner o Singapore wis first adoptit in 1959, the year Singapore became self-governin athin the Breetish Empire. It wis reconfirmed as the naitional banner when the Republic gained unthirldom on 9 August 1965. The design is a horizontal bicolour o reid abuin white, overlaid in the canton (upper-left quadrant) bi a white crescent muin facin a pentagon o five sma white five-pointit stars. The elements o the banner denote a yung naition on the ascendant, universal brotherhood an equality, an naitional ideals. Vessels at sea dae no uise the naitional banner as an ensign. Merchant vessels an pleasure craft flee a civil ensign o reid chairged in white wi a variant o the crescent an stars emblem in the centre. Non-military govrenment vessels such as coast guard ships flee a state ensign o blue wi the naitional banner in the canton, chairged wi an aicht-pointit reid an white compass rose in the lawer flee. Naval warships flee a naval ensign seemilar tae the state ensign, but in white wi a reid compass rose emblem. Rules defined bi the Singapore Arms an Banner an Naitional Anthem Act govren the uise an display o the naitional banner. These hae been relaxed tae allou ceetizens tae flee the banner frae vehicles durin naitional holidays an frae hames at ony time o the year. 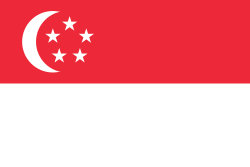 Wikimedia Commons haes media relatit tae Flags of Singapore. This page wis last eeditit on 29 Juin 2016, at 21:21.